PORTLAND, Oregon (CNN) -- Last year, Sam Adams won a landslide victory against 12 other candidates to become mayor of Portland, Oregon. Now he faces a growing effort to toss him from that office. 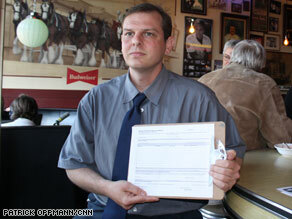 Jasun Wurtser holds a sign-up form for volunteers to work on the campaign to oust Mayor Sam Adams. It's a stunning change in fortunes for Adams after only 4½ months on the job and despite initial predictions that he -- the first openly gay mayor of a large city -- was a rising figure on the national political stage. That was before Adams admitted to an affair with an 18-year-old legislative intern, a rumored relationship he had hotly denied during the mayoral campaign and called "sleazy" and a "smear." Adams' reversal came after the aide, Beau Breedlove, broke his silence about the affair, which took place in 2005, when the mayor was a city commissioner. The mayor apologized for misleading the public and said he waited to begin the relationship until Breedlove was 18 years old, the legal age of consent. Breedlove agreed with the mayor's account but told the Oregonian newspaper that he and the mayor also kissed in a City Hall men's room when he was 17. The Oregon Department of Justice is conducting an investigation into whether the relationship broke any laws. But the crowd that gathered recently at a Portland bar for the first rally to recall Adams did not want to wait to see if the mayor will face criminal charges. "The attorney general is looking into the legal transgressions that Sam Adams did," said Jasun Wurster, an organizer of one of the recall efforts against Adams. "Lying to get elected is unethical. It's not illegal, so the recall is truly the citizen's recourse to hold Sam Adams accountable for his actions." Wurster, who supported a rival mayoral candidate, denies the recall plans are an attempt to re-hold the election. If the truth about Adams' affair with Breedlove had come out during the campaign, Wurster said, the mayor would never have been elected. Commissioner Randy Leonard was an Adams ally who admits he was unwittingly part of that "cover-up." When the rumors first surfaced about the affair, Leonard said he confronted Adams about them and was told the story had no basis. Leonard vigorously defended Adams publicly and says he was as shocked as anyone when he found out that he and the electorate had been lied to. "I am beyond pissed off about it," Leonard told CNN in an interview. But Leonard still argues the mayor should remain in office. "He does a good job," Leonard said of Adams. "I think he learned his lesson and I think larger than that, what's really important isn't whether or not we elect perfect mayors. But when you make a mistake, how do you react to that?" Opponents of the mayor, however, face several hurdles before he can be removed. His detractors intend file a petition for a recall on July 1, six months after Adams will have taken office and the earliest date they can by law begin working to have him removed. They will then have 90 days to collect just over 32,000 signatures from registered Portland voters. If the recall organizers are able to collect enough valid signatures, a special election would be held -- and voters would decide whether Adams stays in office. That election could cost Portland up to $350,000, according to the city elections office. Portland pollster Tim Hibbits said Adams' political future may come down to what if anything the Attorney General's report reveals. "He's taken a lot of hits but he's still floating. I don't know how many more torpedoes he can take." Meanwhile, the mayor's personal life has stayed firmly in the news. His former boyfriend, Beau Breedlove, continues to share intimate details of their relationship with the media and recently posed for racy photographs in an adult magazine for gay men. Adams was also recently involved in a car accident where two bystanders told the Oregonian newspaper they smelled alcohol on him. The mayor denied he had been drinking. No one was injured in the crash, which a police report says occurred when the mayor hit the back of a car that was turning. In their report, Portland police said they did not administer a sobriety test because there were no indications that the mayor was under the influence of alcohol. A spokesman for the mayor said he is not letting the proposed recall or his personal troubles distract him from his job. "He continues to serve the people of this city and hopes to continue to do so," spokesman Roy Kaufman said. Will Portlanders' famous "live and let live" attitude keep the embattled mayor from losing his job? As he left the recall-Adams rally, salesman Dan Allin said there are limits to the city's open-mindedness. "I don't want to live in a place where people are tolerant of dishonesty," he said.